This entry was posted on Saturday, July 30th, 2011 at 13:50 and is filed under Politics, Update. Sir, you’ve offered a laundry list of explanations, some of which appear meritorious on their surface, but which are easily refuted once the details are examined, and the wider strategic context is considered. To carry out this examination, we must first agree upon an objective. I hold that the objective is to begin in earnest the dis-assembly of the leviathan of state, to curtail its wasteful spending, to reduce the scope of its expenditures, and to restore the fiscal and financial house of our government to a solvent course. Assuming that you agree with this precept for action, having campaigned for your office on the substance of these positions, rather than adopting a purely political objective of currying favor with the electorate, or scoring political points against our opponents, we now have a better yardstick against which to measure both the Boehner plan, and your support of it. It is true, as you say, that the Republicans control only one-half of one-third of the government. Be that as it may, the other truth you’ve left unaddressed is that the House of Representatives is the critical ‘one-half of one-third’ in the matter at hand. I say this because under our constitution, it is the House, solely, which is empowered to originate bills on spending and taxation. What the Boehner plan promises is to outsource that authority and responsibility, and to do so would be unconstitutional, but even were it permissible, it would beg the question: Why would you cede your authority to those, who in our shared assessment, stand opposed to doing what is right? Surely, as you and others campaigned for your election last fall, you did not do so on the platform that you would “Hand over power to our opponents, anyway.” I know better. I, along with millions of others, followed and supported your election campaign with great interest, and whatever pledges you did make, this notion was certainly not among them. As a veteran myself, I know that one cannot defeat one’s adversary by surrendering one’s weapons to him. Whatever else you might offer in support of the ‘one-half of one-third’ argument, this is its enduring fallacy: The proposition it offers is that “We can’t win anyway.” That is a matter of some debate, but the corollary implied is: “Without our buckling, we cannot lose.” You see, just as you cannot force the Senate to take up your Cut, Cap, and Balance Bill, neither can the Senate or the President force you to offer anything else. You rightly complain that neither the President nor the Senate ever produced a plan, much less scored one, but the truth is that it is not their mandate, and besides, their strategy is based on obfuscation of their intransigence. What did you expect them to do? Did you expect them to take the position that they should participate in their own defeat? Why would they, sir? Your support of the Boehner plan has already done so, in the opposite direction. You speak of a 70% plan. Assuming for a moment that Cut, Cap, and Balance had been a 100% plan, (and it wasn’t, but at least it achieved a 30-35% bite at the apple,) what percentage does the Boehner plan accomplish with respect to the goals I’ve outlined above? One-half of one-third of one percent? If you could tell us in earnest that it accomplished even one-half of one-third of what Cut, Cap, and Balance offered, I might be inclined to see the Boehner plan more favorably. The ratings agencies will not. Still, all of this supposes that what comes back from conference will look at all like the Boehner plan. In all honesty, what’s likely to come back from conference will be more of a Reid substitute than the original, already much too tepid Boehner plan. This is where your tactical considerations immediately collapse under the burden of the theater-wide realities: When that bill, whatever particulars it may include, comes back from conference, will you be inclined to oppose it if the re-writing has substantially watered-down the original bill? I see another round of arm-twisting and plank-walking in store for you freshmen. Will you fold then, as well? If so, how does such a vote advance the goals and objectives I’ve outlined above? Sir, you have also smeared by implication those members who stood in firm opposition to the Boehner Bill, saying that they have served Barack Obama. If you fold under these pressures, again, when the post-conference bill returns for final passage, who will have won? You, we and the future of our country, or Obama, Reid, and their brethren? The truth is that when the final bill comes for a vote, since it will do so with the blessing and support of Reid and Obama, they probably won’t need your vote, because sufficient Democrats will cross the aisle to support it, since in substance, it’s now their bill anyway. In the end, what will this have made of your tactical retreat? Sir, it will have amounted to strategic surrender. Who will you then smear as serving the purposes of Barack Obama? No sir, in all due respect to your courageous military service to our nation, and with all respect due to a man entitled to his own views and ideas,I believe you are fundamentally mistaken. I think that those who’ve chastised you, who you have now forsaken as “schizophrenic,” have significant cause to rethink their support of you in past and future elections. It is with great sadness that I say this, because as a resident of Central Texas, I’ve followed you since your return to legal controversy from overseas. I, along with so many others, have cherished your record of valiant service in the cause of our nation while you wore the uniform, but sir, you now serve on a different sort of battlefield where ideas are greater than munitions, and the fog of battle becomes an inky blackness that pervades the battle space. It would have been easier to accept and forgive this as a rookie mistake, the error of a youthful and inexperienced commander, had you not multiplied your error with smears against others. I am reminded of General Patton’s predicament after the infamous slapping incident in Sicily. Eisenhower knew that Patton was among his most formidable battlefield commanders, but that his notoriously intemperate conduct frequently permitted his passion to override his reason. Such is the nature of some of our finest historical battlefield commanders, that in their mind, all things are seen as war, and no mercy is spared even for one’s own. Knowing he would later need Patton’s fiery battlefield leadership, and thinking him incapable of carefully extracting himself from the mess he had made, General Eisenhower wisely took the step to relieve Patton of his command. Indeed. Thank you for your continuing service to the country as you believe is best for your constituents. I hope you will consider what I’ve written here in the formulation of your future planning. Thank you for your time and patient indulgence. Well, done, Mark and VERY respectful to Col West, more so than he was to us Tea Party members who have followed him and helped him win his bid for his House seat!! 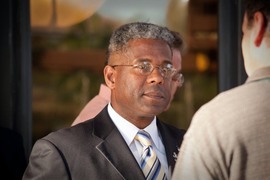 I too believe there should be NO compromise in raising the debt….PERIOD!! Obama, Reid and Pelosi should not be handed yet another blank check for their outrageous spending. It's time to cut up the credit cards and send them to their rooms, seeing as how they are acting like spoiled teenagers! Somebody has to be the adult in the room and it's falling to the GOP leaders to be those adults. I too, am VERY disappointed in Col West and the other freshmen Republicans that caved into the pressure. Thanks! I knew we would never get there in one bite, which was why I was prepared to support CC&B. It wasn't perfect, didn't eliminate the borrowing, but it would have started it toward a serious path that would have likely allowed us to retain our credit rating, thus avoiding much higher interest rates that neither the Reid or Boehner plan will avoid. I hope you don't mind, but I sent Mr. West your link. I was also very offended by his comments, and I called his office and told him he should cancel my check since he thinks we are all a bunch of crazies. Shelby, I don't mind at all. Many people have contacted me to express their grief over the things Congressman West has said about Tea Party folk and conservatives. He needs to learn a bit of self-restraint, since he seems to expect it of those who supported him. Well stated Mark. As a former military commander, I have done things in the ‘heat of battle’ that in hindsight I, too, have regretted. You have given Congressman West a lot to ‘chew on’. I suspect that he will take it in the spirit in which it was served!!! Can I trust you? Should you trust me too? Till there comes a day when we sell our souls away!